Home » What is The Benefit of PPC and SEO When Working Together? The online market is vibrant. A one- month digital marketing strategy can fail the next, leaving you scratching your head. This makes it difficult for small businesses and start- ups to formulate a strategy that meet the customers ‘ needs. On-page Optimization – Including metadata and content keywords to allow search engines to crawl a website and classify it as relevant. Certain additional factors contribute to the SEO value and misunderstandings about how it functions today. External Links – Backlinks from a number of sources to your website to add relevance in a specific niche. PPC – This is a strategy for companies to pay on various platforms, including Google AdWords, Facebook, YouTube, LinkedIn, and Instagram, to return traffic to their website’s respective landing pages. By including SEO and PPC, many possible advantages include increased organic traffic, increased paid clicks, savings in advertising and higher profits. Consider these SIX ways to increase the sum of the coordinated SEO and PPC strategies and tactics. The most obvious advantage of combining SEO and PPC efforts is the addition of exposure on the search engine results pages (SERPs). Clients are often tempted by a number one search term to reduce PPC efforts. However, the top two or three results in the majority of SERPs are PPC ads. It is important to remember. Dominating organic and paid search results will increase traffic considerably and give the impression that you are a permanent presence on a certain market. 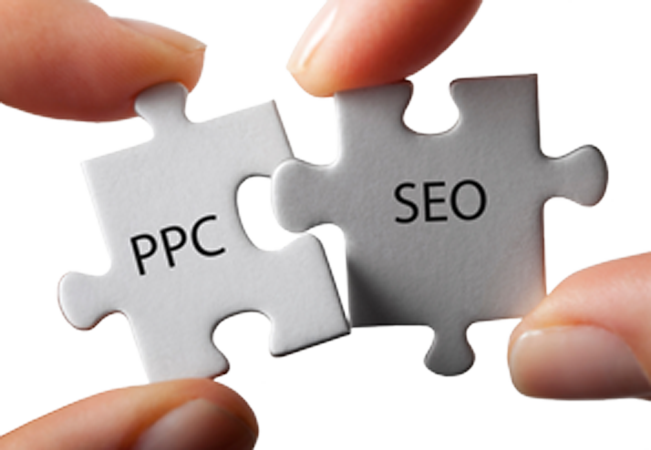 You have twice as many data to analyze by having PPC and SEO campaigns work together. This additional data will enable you in your global research marketing strategy to take more informed decisions. PPC advertisements can also be a useful way to try keywords in your organic strategy. Announcements can be configured to test how well certain words convert. You can then decide whether or not to follow specific sentences in the context of your SEO campaign. As with the testing of PPC-based keywords, it is useful to see which of your ads work well and lead to maximum ad-copy conversions. You can then create title tags, meta describtions and content on the basis of these by taking example examples which work for PPC and try and achieve a similar click with your organic listings through success. Due to immediate results, test elements with PPC are effective. You can see which ads work quickly and easily. Whereas SEO adjustments can take longer to test things such as titles and meta- data. Google does some pretty cool things when it comes to e-commerce. You can now link certain pages with PPC ads. The ad features the product, which often contains reviews, and takes the user to the product page on which a purchase can be made. This is an excellent way to boost your current e-commerce efforts. Over the last few years, ad targeting has increased in its speciality. The PPC team is creating ads for unbelievably specific groups using social media platforms like LinkedIn, Facebook, YouTube and Instagram. The results of these campaigns contain valuable information about your product’s key demographics, which the SEO team can then use to create new content and to refine its SEO strategy. As advertising technology improves, the synergies between PPC and SEO will only increase and the machine learning and artificial intelligence tools will give even more specific focus. PPC advertising is an excellent way to refine your organic keyword strategy. Test the rate of conversion of words you want to classify as ads in PPC with your long-term organic keyword strategy. The effectiveness of the organic keywords you are after will be immediately feedbacked and can adjust your strategy accordingly.